STOCKHOLM (Bloomberg) -- A group led by a Chinese energy company and a Japanese venture-capital firm has placed a bid for bankrupt Swedish carmaker Saab, a spokesman for the investing team said. The two main parties in the group are Sun Investment, a Japanese firm that specializes in high-tech environmental projects, and National Modern Energy Holdings Ltd., which has roots in Hong Kong and builds and owns power plants. "We have placed a bid, and we want to buy Saab and build cars," Mattias Bergman, a spokesman for the group, said on Friday. "We're interested in what Saab's brand stands for, the innovation and competence in the company, and the production facility that's world class." The bidding group has additional participants, Bergman said, declining to identify them. The group has formed a company called National Electric Vehicle Sweden AB "with the only purpose of buying Saab's assets." Karl-Erling Trogen, a former Volvo AB executive, is chairman. Bergman declined to talk about the size of the bid or the group's business plan, including whether the investors primarily aim to build electric cars. "Our name is National Electric Vehicle Sweden, but I can't talk about the technologies at this point," he said. 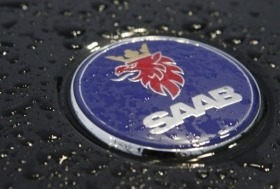 Other companies that have shown interest in buying Saab since the bankruptcy include China's Zhejiang Youngman Lotus Automobile and Mahindra & Mahindra Ltd., India's biggest sport utility vehicle manufacturer. Youngman may be out of the bidding, Swedish newspaper Dagens Industri reported May 23. Saab filed for bankruptcy in December after running out of cash. General Motors Co. sold the Trollhaettan, Sweden-based company in February 2010 to the Dutch sports-car maker Spyker.